A mere four seconds, essentially about a boat length, decided the winner and runner-up after 81 miles of fast downwind sailing in the 2016 Santa Barbara to King Harbor Race. John Seitz’s Viper 830 “Warrior,” and Scot Tempesta’s Melges 32 “Anarchy,” were actually only a boat length apart Thursday afternoon in the parking lot of Santa Barbara Yacht Club. Who could have known that Thursday’s parking lot would be symbolic for Saturday’s race results? Both boats made the easier trailering delivery option to Santa Barbara and spent Thursday setting up, rigging, and launching before Friday’s race. Being one of the lower handicapped boats in our division (ULDB-A/Sport) we needed the wind to cooperate for us to score well against the bigger and faster boats. Wind forecasts improved as race day approached. The wind arrived and delivered better than promised, all we had to do was connect dots and not let the “rubber band” break with the quicker boats. Many lessons were learned after a difficult (for us) and very wet Newport to Ensenada Race earlier this year. Slight changes in the mast setup were made, as was every effort to keep water out of the boat. Having raced against the Viper 830 in previous SB2KH races on the Carrera 280 “Carrera,” we knew we had a good horse for the course with Warrior (previously known as “Plankton”). Our crew consisted of owner John Seitz, the Bunce brothers Jeff and Dan, and myself. In pre-race planning and from prior observations, we felt the Viper could improve on the power reach out to Anacapa Island. The boat has great righting moment but less than ideal form stability. An Ullman Sails Redline Code 5A (Airx 700) was added to the existing inventory of reaching sails: light air Code Zero and Code 1A. We started with a 155% jib top but shortly hoisted the 5A. Out of the blocks, Bernie Girod’s Farr 400 “Rock & Roll” was launched, the J-125s picked their slots, N2E winner Bolt 37 “Valkyrie,” and the new MC 31 “Sundowner,” chose their slots, too. Our plan was to lean left and take advantage of the lifting breeze down the track. About seven miles from the island and seeing boats ahead still power reaching, we started to fear that the lift was never going to develop. We changed course from aiming at the middle to bottom of Anacapa, to now aiming at the middle and upper end of the island. This made us slower and even more on edge with the 5A but seemingly necessary at the time, ensuring we made the West End of the Island. The lift did come at the very end and the gain was to those who 100% committed to the low approach. Precious time was lost for our decision to change course. We rounded the top end of Anacapa Island with the Farr 40 “Blade”, XP44 “DistraXion,” and what we thought was a 1D-35 but was actually the MC31. The spinnakers of the J-125s and various Fast 50s were not so far ahead. We were in the hunt, but needed to work harder. We changed into our Code 2A at this point to attack the back side and for the blast back to the coast. We had a clean run down the back side and exit from Anacapa, leaving with the boats we entered with, and we focused on the boat going low and fast with the 2A. Speed sailing with great trimming and driving brought a top speed of 16.7kts by Dan. We could still easily identify the J-125s and Fast 50s as we approached the Malibu area. We had sailed lower than the MC31 who was very fast but on hotter angles and a lot of extra miles. Our plan from Pt. Dume to King Harbor was to dig a bit inside Santa Monica Bay and get a good slot to the finish. Gybing onto starboard just outside Pt. Dume we did the “duh” move. “Hey, we’re only 10-15 degrees above King Harbor, we’re going at about 10kts and the wind is supposed to be going SW-S direction. Let’s keep going and not jog left anymore”. Two hours later we watched boats we had already sailed with and ahead of, train right below and past us. We reluctantly gybed to port about two-thirds down the track to get a tease closer to where we should’ve been already! Apparently the Farr 400 “Rock & Roll” drank the same Kool-Aid as we did, by heading straight across the top of the bay but paid more of a price for it. About seven miles from finish, it got real slow. Two to three miles from the finish, we still ended up South of King Harbor, and we did not want to be there! The MC31 came further out of the right corner (South) and we gybed with them. We snuck around the bell buoy just ahead of the Farr 40 “Foil,” sheeted in the 2A and finished. With poor course management across Santa Monica Bay and the lighter winds at the end, we completely thought the “rubber band” had broken between us and the faster boats in our division. Even with a weak finish we were completely stoked about a great day of racing. The boat did great, sails worked perfectly, the crew work was solid, and again, lessons were learned. We were in complete disbelief upon seeing the Viper 830 “Warrior” in the first place position on the results scoreboard at KHYC! The hot dogs, chili, and drinks tasted a little better with the surprise placing. We were all very pleased with the victory, knowing everything had to go nearly perfectly to even get a spot on the podium. A combination of solid preparation, good execution and a lot of luck seemed to be the right formula this year! Huge congratulations on a sweet victory to John, along with many thanks to him and the Bunce brothers for their effort and contributions! This past weekend “Team Warrior” (DPYC) scored all 1st (Class, Fleet, Overall) in the 44th Annual Santa Barbara to King Harbor race. 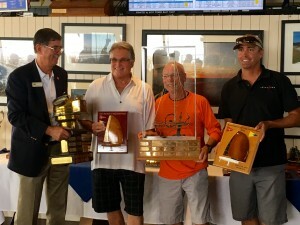 The team consisted of Ken Cooper (Ullman Sails), Jeff Bunce, Dan Bunce, and John Seitz (owner). Warrior, a Viper 830, competed in the very tough ULDB-A fleet against Timeshaver, Derivative and Warrior (all J125s), Rock n Roll (Farr 400), Anarchy (Melges 32), the new MC31, an FT10 and Valkyrie (the new Bolt 37). Overall boats included Grand Illusion, Medicine Man, and Taxi Dancer. We drove the boat hard, surfed the waves, hit the puffs and attained a top speed of 16.4 knots (Dan driving). Our all Ullman inventory and smart sail selection certainly was key to our win. Our new Code 5A enabled us to get out to Anacapa quickly with a slightly below rhumb line reach that anticipated the slight right shift we would need to clear the island. Once around, we powered up with the 2A and drove the swells all the way to the finish. We all had our turns on the helm and trimming the sails. It was fantastic teamwork and ideal conditions for our small Warrior. Thanks to the Santa Barbara Yacht Club and King Harbor Yacht Club for terrific parties, great facilities and a fantastic race. See you again next year.